Compared with custom organs and computer produced art, the public has less confidence that the two common science fiction tropes of teleportation and colonization of other planets will come to pass. Two in five Americans (39%) think that teleportation will be possible within the next 50 years, while slightly fewer—33%—expect to live in a world in which humans have long-term colonies on other planets. Young adults are especially likely to view space colonization as a long-term eventuality: 43% of 18-29 year olds see this happening in the next half-century, compared with about a quarter of those over age 50. On the other hand, high-income Americans are pessimistic about the prospects of space colonization: just 20% of those with an annual household income of $75,000 or more think this is a realistic prediction. From a list of futuristic inventions that includes space colonies and teleportation, Americans actually have the least confidence in the prediction that humans of the future will be able to control the weather: just 19% of the public thinks that this will probably happen. Older adults are especially pessimistic about this development, as just 11% of Americans ages 65 and older think that controlling the weather is likely to happen over the next 50 years. But even among the most “optimistic” demographic groups, the expectation that humans will control the weather in the next half-century is a decidedly minority viewpoint. Advancements such as teleportation or space colonization will likely require massive leaps in scientific knowledge and effort before they can become a reality, but the widespread adoption of other “futuristic” developments is potentially much nearer at hand. With the recent introduction of Google Glass and other wearable computing devices, for example, it may be only a matter of time before most people walk around being directly fed a constant stream of digital information about their surroundings. And the widespread use of personal and commercial drones may depend as heavily on regulatory decisions as on advances in engineering. Despite their general optimism about the long-term impact of technological change, Americans express significant reservations about some of these potentially short-term developments. We asked about four potential—and in many cases controversial—technological advancements that might become common in near future, and for each one a majority of Americans feel that it would be a change for the worse if those technologies become commonly used. Of the four potential developments we measured, public attitudes towards ubiquitous wearable or implanted computing devices are the most positive, or more accurately, the least negative. Although 53% of Americans think it would be a bad thing if “most people wear implants or other devices that constantly show them information about the world around them,” just over one third (37%) think this would be a change for the better. The legal and regulatory framework for operating non-military drones is currently the subject of much debate, but the public is largely unenthusiastic: 63% of Americans think it would be a change for the worse if “personal and commercial drones are given permission to fly through most U.S. airspace,” while 22% think it would be a change for the better. Men and younger adults are a bit more excited about this prospect than are women and older adults. Some 27% of men (vs. 18% of women), and 30% of 18–29 year olds (vs. 16% of those 65 and older) think this would be a change for the better. But even among these groups, substantial majorities (60% of men and 61% of 18-29 year olds) think it would be a bad thing if commercial and personal drones become much more prevalent in future years. Countries such as Japan are already experimenting with the use of robot caregivers to help care for a rapidly aging population, but Americans are generally wary. Some 65% think it would be a change for the worse if robots become the primary caregivers to the elderly and people in poor health. Interestingly, opinions on this question are nearly identical across the entire age spectrum: young, middle aged, and older Americans are equally united in the assertion that widespread use of robot caregivers would generally be a negative development. Americans have similar apprehensions toward the issue of designer babies: 66% feel that it will be a change for the worse if “prospective parents can alter the DNA of their children to produce smarter, healthier, or more athletic offspring,” while 26% say it would be a good thing if this happens. Lower-income Americans have slightly more positive views on this subject than those in higher income brackets: 31% of those earning less than $30,000 per year think this would be a change for the better, while just 18% of those earning $50,000 or more per year agree. Those Americans who are optimistic about the future of scientific advancement in a general sense tend to be more open—up to a point—toward the benefits of some of these more controversial developments. 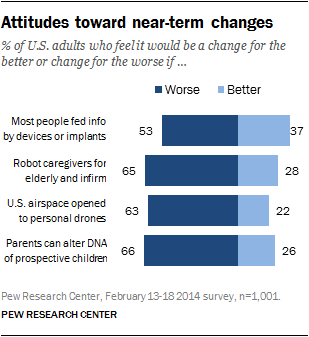 These long-term optimists (that is, those who agree with the statement that “technological changes will lead to a future in which people’s lives are mostly better”) are roughly twice as likely as long-term pessimists to say that it will be a change for the better if personal drones become widespread (28% vs. 14%) and if many people wear devices or implants that feed them digital information about their surroundings (46% vs. 23%). They are also receptive toward robot caregivers (33% think these would be a change for the better, while 21% of pessimists feel this way) and toward designer babies (31% vs. 19%). But notably, even within this “optimist” group, a substantial majority feel that most of these developments would be a bad thing overall. Most new inventions appeal at first to a relatively small group of adventuresome early adopters, with the bulk of consumers following along only after they have had a chance to see for themselves what the fuss is about. And indeed, many Americans have a pronounced skepticism toward some new inventions that they might be able to use or purchase in the relatively near future. Of the three inventions we asked them about, Americans are most interested in riding in a driverless car: 48% would like to do this if given the opportunity, while 50% say this is something they would not want to do. College graduates are particularly interested in giving driverless cars a try: 59% of them would do so, while 62% of those with a high school diploma or less would not. There is also a geographical split on this issue: Half of urban (52%) and suburban (51%) residents are interested in driverless cars, but just 36% of rural residents say this is something they’d find appealing. Other potential inventions appeal to a much smaller proportion of the public. One quarter of Americans (26%) say they would get a brain implant to improve their memory or mental capacity if it were possible to do so, while 72% would not. College graduates are the main demographic group that stands out on this issue: 37% of them would be willing to get a performance-enhancing brain implant if given the chance. 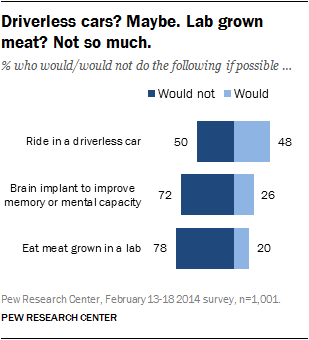 Similarly, just one in five Americans (20%) would be willing to eat meat that was grown in a lab. Men express a greater willingness to do so than women (27% of men and 14% of women say they would give lab grown meat a try), and college graduates are around three times as likely as those who have not attended college to say this is something they’d attempt (30% vs. 11%). In addition to capturing the public’s attitudes toward specific inventions or future outcomes, we also offered them the opportunity to tell us—in their own words—which futuristic invention they themselves would want to own. Based on their responses, many Americans are looking forward to a future in which getting from place to place is easier, more comfortable, or more adventuresome than it is today. 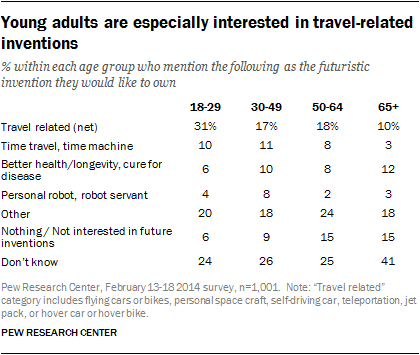 A total of 19% of Americans would like to own a travel-related invention of some kind, including: a flying car or flying bike (6%), a personal space craft (4%), a self-driving car (3%), a teleportation device (3%), a jet pack (1%), or a hover car or hover board (1%). Time travel and health-related inventions also rank highly. One in ten Americans (9%) list the ability to travel through time as the futuristic invention they would like to have, and an identical 9% would want something that improved their health, increased their lifespan, or cured major diseases. At the same time, many Americans seem to feel happy with the technological inventions available to them in the here and now—11% answered this question by saying that there are no futuristic inventions that they would like to own, or that they are “not interested in futuristic inventions.” And just over one quarter of them (28%) weren’t sure what type of futuristic invention they would like to own. Younger adults are especially excited at the prospect of new travel options in the future. Some 31% of 18–29 year olds mentioned some sort of travel-related invention as the future technology they would like to own, significantly higher than any other age group. Meanwhile, some middle aged Americans just want some help around the house—8% of those ages 30–49 said they would want a personal robot or robot servant. And although interest in time travel is fairly consistent across age groups, it holds little appeal to older adults—just 3% of seniors mentioned time travel or a time machine as their future invention of choice. Indeed, many older Americans seem unexcited about futuristic inventions of any kind, as 15% say there is no particular invention they would like to own, and 41% are unsure what type of invention they would enjoy. Fact Tank: Reality check: How close are we to teleportation and Mars colonies?